A new way of separating arriving aircraft at Heathrow Airport by time instead of distance in order to cut delays caused by strong winds has gone live as part of a phased introduction this year. Traditionally, air traffic controllers separate flights by set distances dependent on the aircraft type and the size of the spiralling air turbulence – or wake vortex – they create as they fly. However, during strong headwinds aircraft fly more slowly over the ground resulting in extra time between each arrival. Having to maintain a set distance in those conditions reduces the landing rate and can cause delays and cancellations. On a normal day around 40 aircraft an hour land at Heathrow, but that can drop to just 32 on windy days, which is capacity that can’t be reclaimed because the airport is so busy, having been essentially full for the past decade. Time Based Separation (TBS) takes live wind data from the aircraft to dynamically calculate the optimal safe spacing between each aircraft in order to maintain the landing rate. Its introduction is expected to halve current headwind delays at the airport and significantly reduce the need for airlines to cancel flights. Martin Rolfe, NATS Managing Director Operations, said: “Working with Lockheed Martin, we’ve produced a world first that will deliver major benefits to the airport, to airlines and to passengers. 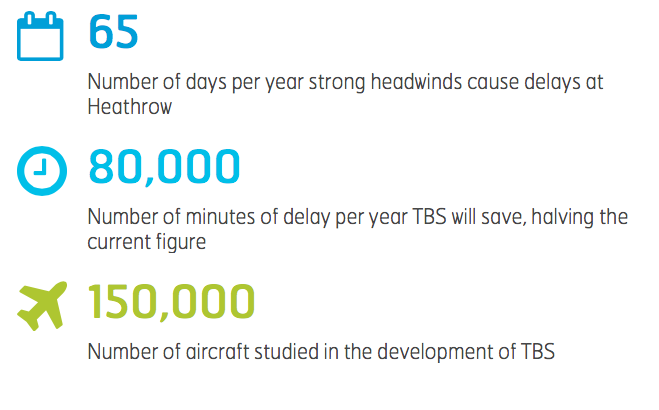 Strong headwinds are the single biggest cause of arrival delay and Heathrow and the introduction of TBS will radically reduce delays and cancellations while improving the airport’s resilience against disruption. NATS has studied over 150,000 flights to measure the behaviour of aircraft wake vortices in strong headwinds, with the results showing that they dissipate more quickly in windy conditions. This means aircraft can be safely separated on final approach using a time based method. The TBS tool has been developed by NATS with Lockheed Martin and while it is initially being introduced at Heathrow, it would also prove beneficial at other major airports both in the UK and around the world.